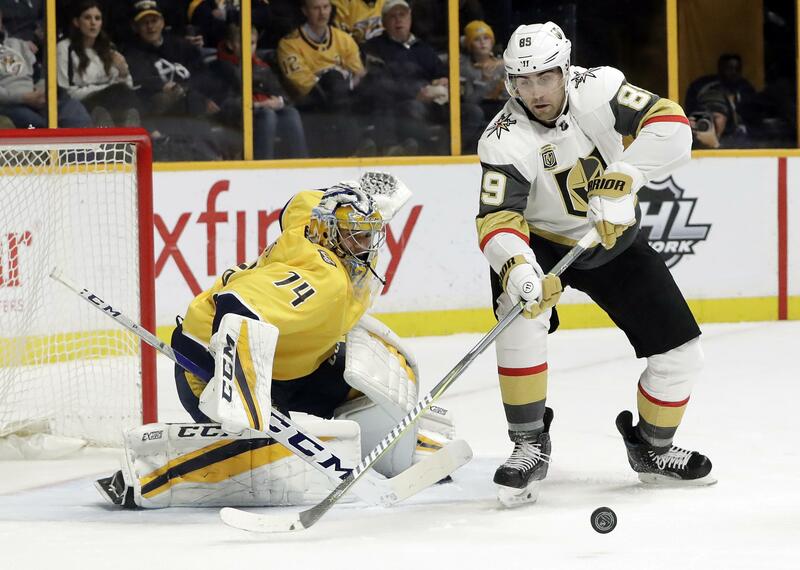 Tue., Jan. 16, 2018, 10:31 p.m.
NASHVILLE, Tenn. – Juuse Saros made 43 saves, Kevin Fiala scored eight minutes into the third period and the Nashville Predators beat the Vegas Golden Knights 1-0 on Tuesday night. Nashville played its first game in a week and has won three straight. The shutout was the third of the season for Saros and the fourth of his career. Marc-Andre Fleury stopped 26 shots for the Golden Knights, who have lost two in a row. Saros was superb, especially against Vegas forward Jonathan Marchessault, who peppered 10 shots on the Finnish netminder but was unable to get one by him. TORONTO (AP) – Alexander Steen tied it with 57 seconds left and Vince Dunn scored 1:43 into overtime, lifting St. Louis over Toronto. Connor Brown put Toronto ahead on a short-handed breakaway midway through the third period, but Steen scored with goalie Carter Hutton pulled for an extra attacker by backhanding Alex Pieterangelo’s rebound past Frederik Andersen. Dunn snapped a low shot past Andersen after choosing to keep the puck on a 2-on-1. Andersen stopped 40 shots and Hutton had 30 saves. GLENDALE, Ariz. – Joe Pavelski scored the only goal of the shootout to lift San Jose over Arizona. Pavelski scored on San Jose’s first attempt, and Sharks goalie Aaron Dell was perfect through three rounds in his first NHL shootout. Dell also had 30 saves. Joe Thornton and Mikkel Boedker had regulation goals for San Jose. Antti Raanta had 20 saves for Arizona. Brad Richardson had a goal and assist, but the Coyotes lost their fourth straight game and have dropped 17 of 21. DETROIT – Jason Spezza responded to being benched by scoring two tiebreaking goals on power plays, helping Dallas beat Detroit. Spezza scored on a lunging one-timer below the left circle with 5:52 left in the second period. His first goal came on a redirected shot midway through the first. The 33-year-old forward was a healthy scratch Monday when Dallas won at Boston in overtime. He bounced back by ending his 14-game goal drought, scoring twice in a game for the first time since March 12, 2016. Spezza scored 33 goals just two years ago and has 323 career goals. Dallas’ Radek Faksa and Martin Hanzal also scored. Ben Bishop stopped 13 shots for the Stars, who have won six of eight. NEW YORK – Damon Severson scored twice 1:26 apart in New Jersey’s three-goal second period, and the Devils ended a six-game skid. Kyle Palmieri and Taylor Hall also scored for New Jersey, which was 0-3-3 since beating Detroit at home on Dec. 27. Keith Kinkaid, getting the start after Cory Schneider was a late scratch due to illness, stopped 25 shots. Anders Lee scored and Jaroslav Halak made 38 saves as the Islanders snapped a three-game winning streak that started with a 5-4 shootout victory over the Devils here on Jan. 7. New Jersey trailed less than two minutes in but got four straight goals starting with Palmieri’s score late in the first period. NEW YORK – Rick Nash scored twice while New York notched five straight goals, and the Rangers rolled over Philadelphia. New York snapped a three-game skid and improve to 23-17-5. Henrik Lundqvist made 25 saves. Published: Jan. 16, 2018, 10:31 p.m.